This is the Sound of Adamsdown is the result of a unique collaboration between experienced songwriters and residents of the inner city neighbourhood of Adamsdown, Cardiff. Jon Blake has written and performed songs for over forty years, but is best known as a children’s author. Over fifty of his books were published during the nineteen years he lived in Comet St, Adamsdown. Mark Roberts was a guitarist and songwriter with Catatonia. At the peak of their success he was living in Gold Street, Adamsdown. By chance the two became neighbours in 2009, and a year later began collaborating on this project. All the songs on This is the Sound of Adamsdown were inspired by the experiences of the participants. The aim was to create a portrait of the area through the people who live here, or who grew up here and still have strong family connections. The music scene today is full of artists who have little to say besides what it’s like to be rich and famous. At the same time there are millions of people with stories to tell who never get heard. Why shouldn’t songwriters write for these people instead? 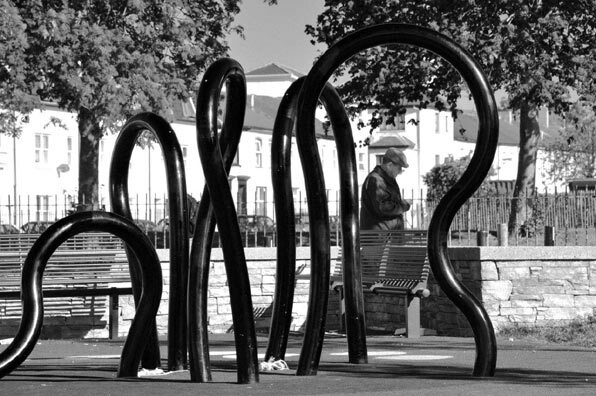 Adamsdown is a richly varied area with a strong identity, but like many inner city communities has suffered from the growth of long-term unemployment and the ever-widening division between rich and poor. But such problems are not the fault of Adamsdown’s residents. This CD celebrates the energy and character of the people living here. Of course there are many more Adamsdown residents whose voices need to be heard, and (inevitably) we have only partially succeeded in recording a cross-section. That’s why we’ve called the album Volume One to leave the door open for more albums which could concentrate on different sections of the community. Once the costs of making the CD have been met, any money made from CD sales will go into a fund to generate future projects. For an idea of some of the other music being made in the area, particularly in a thriving youth music scene, check out these news stories and videos. Finally, no-one was chosen for the project because of their singing ability, beyond being able to roughly sing in tune. It is a real bonus that we have actually uncovered some fantastic singers. Everyone rose to the challenge of delivering the song that was written for them. The project was made possible by the Communities First Trust Fund, administered by the WCVA, which has supported work in the most disadvantaged communities. This is the Sound of Adamsdown is the follow-up project to Adamsdown Song, which involved pupils from the area’s three primary schools. All songs written by Jon Blake and produced by Jon Blake and Mark Roberts. Beats, bass, guitars – Mark Roberts. Guitars, keyboards, bass on Ruby Street, all instruments on Phoenix and Crystal Moment – Jon Blake. Backing vocals – Natalie Grice and Jon Blake. Cover art – Hamse Mohamad (Adamsdown Primary School). Art on rear cover – pupils of Adamsdown and Tredegarville primary schools. Special thanks to Andy Williams, project coordinator, Andrea Hunt, and Tony Camilleri, for his unmatchable knowledge of Adamsdown folk. Also thanks to the Adamsdown Communities First team and choir facilitator Laura Bradshaw who was so helpful during the chaotic recording of Adamsdown Song over four weeks at the resource centre on Moira Terrace. Finally, credit must go to Simon Armitage, whose musical documentaries such as Songbirds and Feltham Sings provided the initial inspiration for This is the Sound of Adamsdown.